No work in the shed last night, on account of aches, pains, freezing despite sitting beside the fire, and the usual pre-cold fun stuff. I crashed, went to bed, worked from home today (yes, you can type while under a duvet), and by afternoon was feeling somewhat more human. It’s… slightly larger than anticipated. But not by too much. What it was was loud. The specs said under 85dbA, the meter says 96dbA. 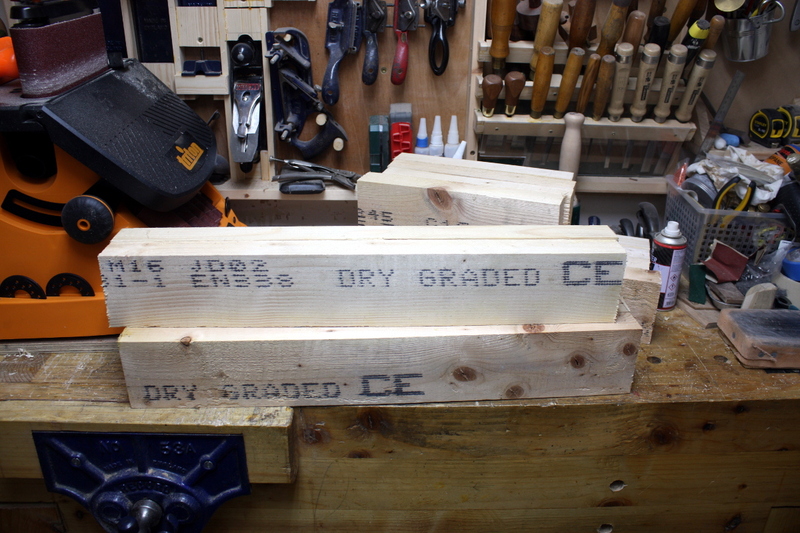 And when you start sanding, it peaks somewhere around 106dbA – 3dBA louder than the dang bandsaw. Hmmm. Maybe when it’s on the base and everything’s nailed down… yeah, who am I kidding. Not sure what to do about this. 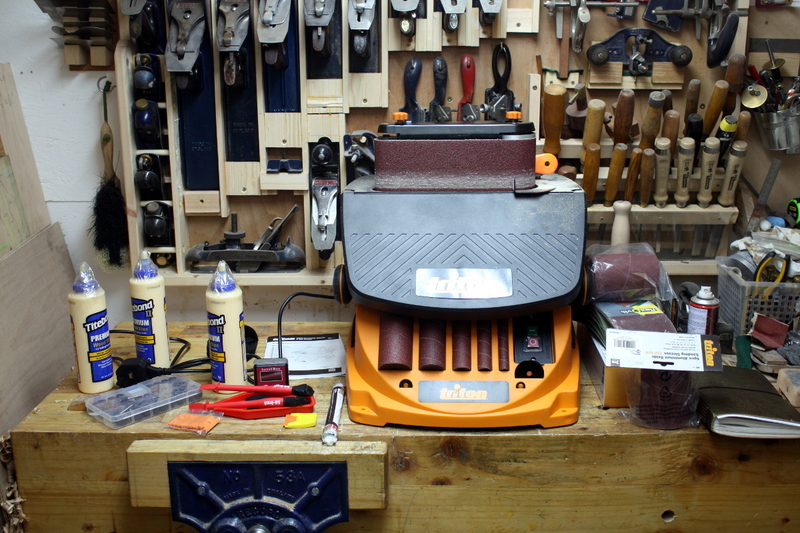 At least it doesn’t have a lot to do in the shed, it’s mainly for bandsaw boxes and the like. Well, at least I’m all stocked up on glue for a while. I’m looking forward to trying the plastic razor blades as well to see how they cope with glue cleanup. 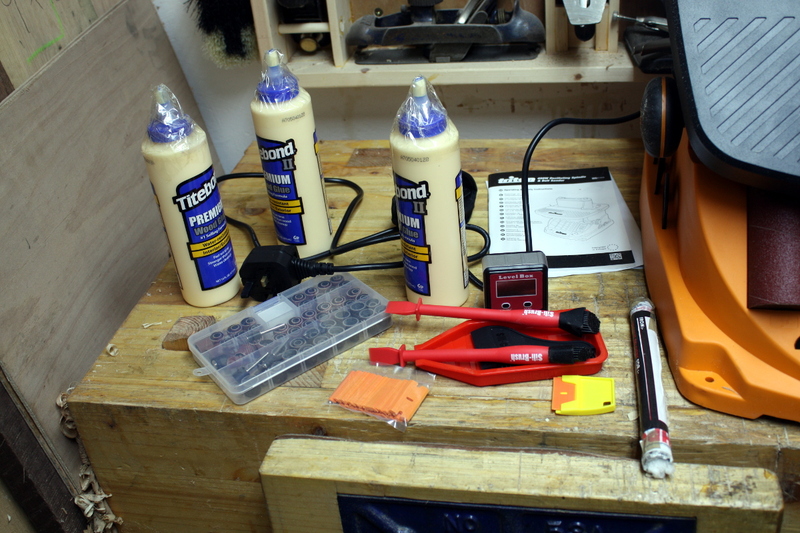 The angle box may be useful for the bandsaw and the sanding table, all the dremel sanding paper should be useful for small parts, and the black-and-white tube there on the right up against the triton are some teflon rods that I’m going to use to replace the steel rods that are the bandsaw guides on the bandsaw. 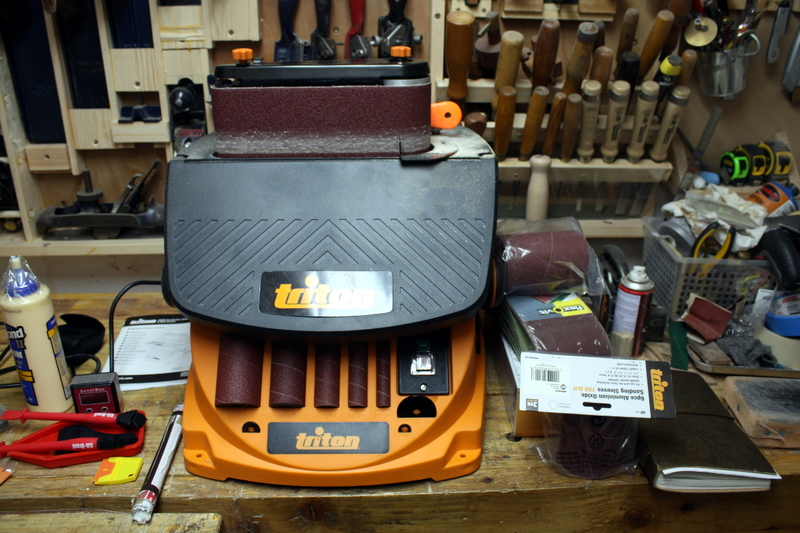 This way I figure I can tighten the guides up against the blade itself, turn it on for a minute or so and it’ll wear away the teflon to get the perfect spacing without damaging the blade. We’ll see. There are some smaller ball bearings in the post as well to try to replace the thrust bearings with so the larger blades don’t contact them when running without load, which is how every guide out there says to set them up (the bandsaw guide holder I have just won’t let me adjust that, because Cheap Tool 😀 ). That’s the twp sides done. 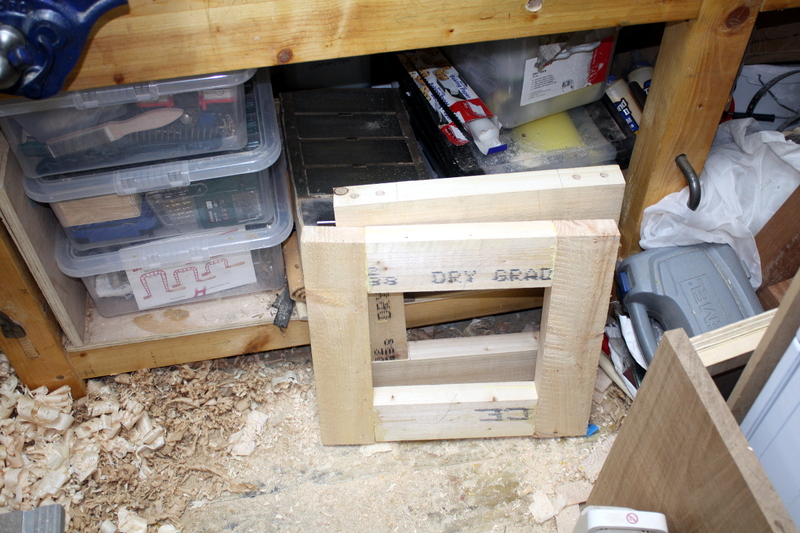 Next up, five crossbars (two up top, two undeneath which get castors later, and one at the back for cross-bracing), all of which will be lap-jointed to the sides along with glue and screws. And if I can find metal bracing brackets tomorrow I’ll use those too. This thing is going to be ugly and I don’t care, I’ll do a nicer one later on. Like, after this one breaks. BTW, on the right, a Bosch power drill. 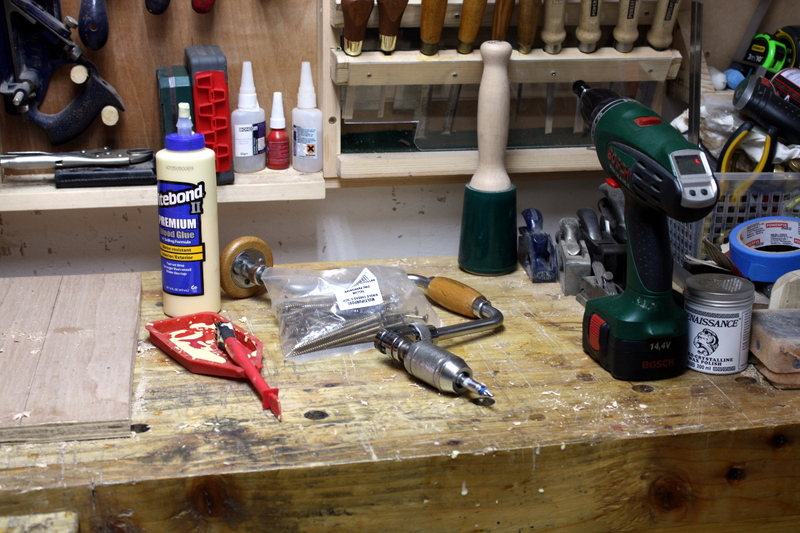 On the left (well, in the middle really), a brace with a hex key screwdriver bit that doesn’t really fit the jaws. Three guesses which one crapped out on me after the second screw? Hint: it wasn’t the seventy-year-old tool that has so much torque it could twist the screw into a pretzel if you wanted to. Stupid batteries. If I wanted to replace them, I’d just buy a new drill – it’s almost cheaper that way (do you want one battery for 50 euro or two batteries and a new drill for 80?). Gah.